Working in a very small magazine in London, Sidney Young (Simon Pegg) has great ambitions in this life. He wants to be a great entertainment journalist, but he’s just not getting invited to parties. Much to his surprise, after publishing a snarky piece about Clayton Harding (Jeff Bridges), editor of a very big and very successful and very glossy celebrity magazine in America, that very same person phones up and offers him a job. In New York! Living in a run-down apartment building with a Polish landlady (Miriam Margolyes, who is fantastic), life for Sidney turns out to not to be quite as great as he thought. His colleague Alison (Kirsten Dunst) doesn’t like him, and neither does her boss Maddox (Danny Huston). Nor do the celebrities or their managers, because Sidney’s writing style leaves a little to be desired. It’s not as commercially viable as it is snarky. With cameos by moviestars like Thandie Newton (as herself) and comedians Chris O’Dowd (The IT Crowd, The Crimson Petal and the White) and James Corden (err, he’s in everything, everywhere? ), How to Lose Friends & Alienate People is a moderately funny story about a right prick who deep down inside somewhere is actually a nice guy who cares about people. The wrong people, granted, but that’s a lesson learned. If you enjoy fish-out-of-water stories, Simon Pegg – well, he is a very funny man – or any of the other actors, this is an entertaining film to watch. Megan Fox might possibly do better playing a charicature of herself than actually playing serious roles, but at least she doesn’t get to talk a lot. Loved seeing Gillian Anderson, of course, proving that she has an acting career outside of The X-Files. As a film, HtLF&AP probably won’t bowl you over with hilarity, but it’s good for a chuckle or two, and the nods to The Big Lebowski were appreciated (Alison’s boyfriend’s favourite drink is White Russian, as well as calling the Polish landlady “Lebowski” by mistake the first time) … although admittedly, The Big Lebowski is a film you can get more mileage out of. 3 out of 5 unfinished novels. 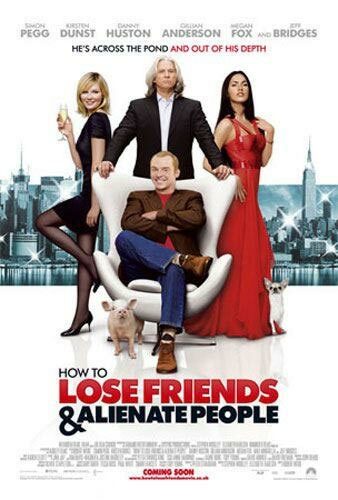 2 Responses to "How to Lose Friends & Alienate People (2008)"
I’ve never heard of this movie but the premise is one I like and it sounds fun. Will have to see whether NetFlix has it. I just love your movie reviews, btw. Thank you very much. 🙂 Yup, it’s an okay film. Would be interesting to hear what you make of it!